The First Judicial District Commission on Judicial Performance unanimously recommends that Judge Margie L. Enquist BE RETAINED. Judge Enquist was appointed to the First Judicial District Court in October, 2004. Prior to her appointment, Judge Enquist was a Deputy District Attorney in the First Judicial District. 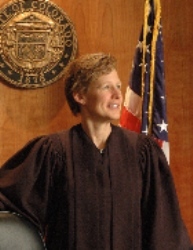 Judge Enquist received her undergraduate degree from Metropolitan State College and her law degree from the University of Minnesota. Judge Enquist has continued to be active in the local community sharing legal knowledge and perspective with both attorneys and citizens within the judicial district. Judge Enquist has shown initiative by taking a leadership role to establish a special court to serve veterans and others who are in the judicial system due to mental health issues. Judge Enquist is generally viewed as fair and timely in her decisions. Among attorneys responding to the survey, 76% recommended retention, 14% not to retain, and 10% made no recommendation regarding retention. Among non-attorneys responding to the survey, 81% recommended Judge Enquist be retained, 13% not to retain, and 6% made no recommendation regarding retention. Judge Enquist’s survey scores reflect two areas in which she is striving to grow. First, Judge Enquist has been described by some attorneys as showing a lack of patience, perhaps due to her serious demeanor during the courtroom process. Judge Enquist is aware of the need to reflect more acceptance and appreciation toward those appearing in her courtroom. Second, while 83% of non-attorneys surveyed perceived Judge Enquist as non-biased in criminal cases, 51% of surveyed attorneys perceived Judge Enquist as biased toward prosecution. Judge Enquist is aware of the need to convey her sense of fairness, through active listening and openness to what attorneys and witnesses have to say. The Commission is impressed with Judge Enquist’s positive strides and dedication. She has shown initiative with the newly-formed Veteran’s Court and with other new court processes available to improve service to the community. Based on these findings the Commission unanimously recommends Judge Enquist BE RETAINED.